Never before has technology this advanced been brought to the masses. Smith's Camber MIPS Snow Helmet utilizes ultra-light In-Mold construction to minimize mass and maximize ventilation without sacrificing one ounce of protection or style. Never before has technology this advanced been brought to the masses. 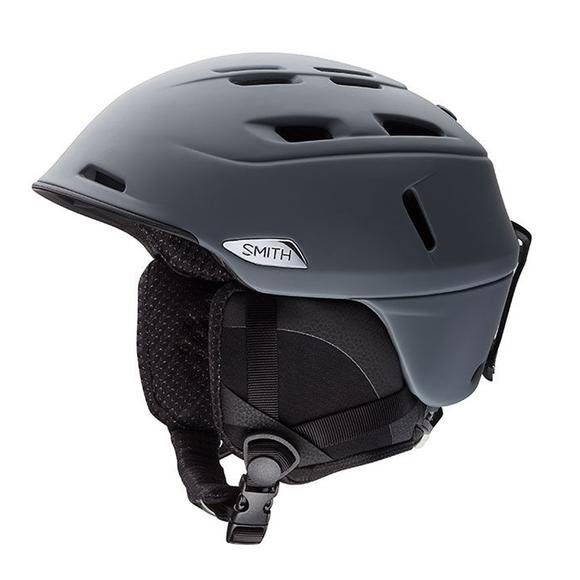 Smith&apos;s Camber MIPS Snow Helmet utilizes ultra-light In-Mold construction to minimize mass and maximize ventilation without sacrificing one ounce of protection or style. At Smith, they design helmets and goggles to work together as a fully integrated system. For the helmet line, the most important factor in integration is the AirEvac ventilation system. This is the bridge that allows goggles and helmets to function as one system, venting warm moist air away from the goggles, through the helmet climate control system and ultimately away from the head. Ultimate integration starts with the precise fit of the Smith goggle and helmet. Smith helmets are designed to match the curvature of the goggle frame, eliminating &apos;gaper gap&apos; and allowing precise alignment between the helmet AirEvac and the goggle venting systems.